President Hendrix present a birthday cake to J.C.
Students display ram cupcakes baked by volunteers. 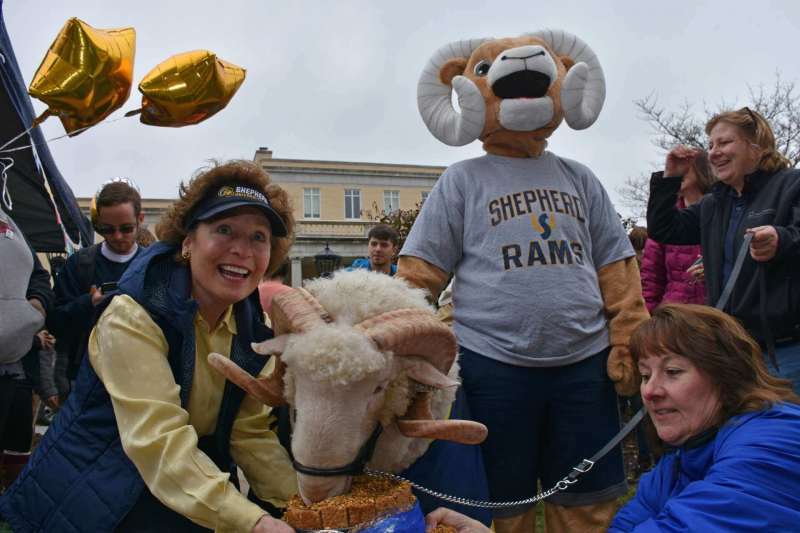 Shepherd’s ram mascot J.C. had his first birthday celebrated on March 28 at a party in front of Scarborough Library that featured music students singing Happy Birthday. 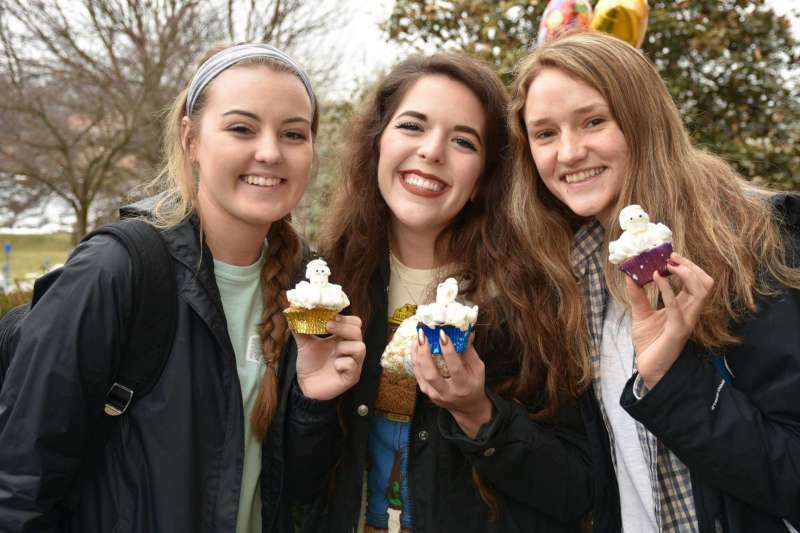 President Mary J.C. Hendrix presented J.C. with a granola cake while snacks for students, faculty, and staff featured cupcakes topped with marshmallow rams made by volunteers. J.C., a Dorset ram, was purchased a year ago with donations from alumni Al ’67 and Sara ’67 Lueck; Holly Morgan Frye ’09 M.A., assistant vice president for student affairs and director of community and congressional relations, and her husband Jim Frye ’68; and Dr. Ben Martz, dean of the College of Business. J.C. has been attending Shepherd football games and a variety of other events throughout his first year on campus. The tradition of having a live ram mascot named in honor of the current president goes back to the presidency of Dr. Oliver S. Ikenberry, with Ike the ram. Dr. James A. Butcher had Butch, Dr. Michael P. Riccards had Mike, Dr. David L. Dunlop had Livingston, and Dr. Suzanne Shipley had Zan. To view photos from the event, visit https://www.flickr.com/photos/shepherdu/albums/72157691905225792.